This is a huge world where the population is lashing out, among them all you may find few artists that are making and creating history in the various art genres. Artists never remain immobile because their imagination is always at work from south to north and from east to west. There is never a stop button in their life, and that’s a guaranteed verdict. They may be out of the scene, silent and mute but soon after they reveal a masterpiece to enthrall the masses. Graphic designers also belong to the artist’s clan, they are no way any different from them. So when the clients come up with various queries in their minds onto the desk of the designer that is the time when he has to go about with patience and kindness. He cannot get furious and annoyed at his clients because they are only wanting to get their work done professionally, besides the fact that almost becomes hard to cater their exaggerated needs at times. Obviously the perspective of the designer and that of the client is two different things, it is more like poles apart, a client can never get the exact perception what the designer has put up, so he should try to play cleverly and present the art work with its extreme outlook so no question can be raised furthermore. 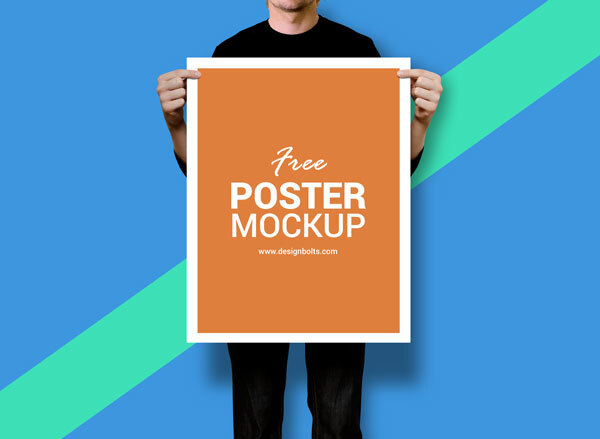 Today I am unfolding before you free high quality poster mock-up PSD file, as you know presentation pays back a million times so never compromise on it before your clients. The approval, rejection, remake and alteration, all can come over you just on the basis of your presentation. So give a best shot and you can meet a desire end for sure. Have a look at the mock up that I designed lately, as I have been searching out similar kind (where a man holds the mockup vertically), but sadly, I couldn’t find it on the web so the idea of making this mockup hit me and that’s how it came about. Come right back to the blog because we are packed up with some amazing posts for you all. I hope you are keeping pace with each on the design & art post, believe me, your remarks mean a lot to us and we try to overcome the flaws, so to accommodate you with all our heart. Subscribe us for more posts and I am sure you won’t regret your precious presence here.